Buy the Mortdecai trilogy cheaply from Amazon. You too can earn money from writing articles by signing up for InfoBarrel. 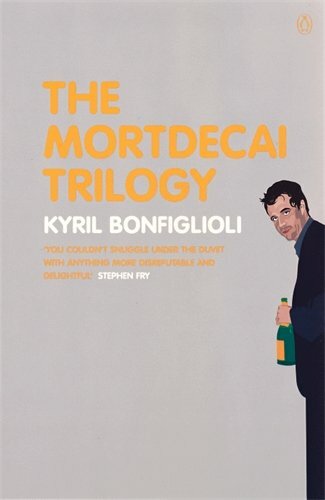 Mortdecai is based on the novel Don't Point That Thing at Me by Kyril Bonfiglioli. Lord Charlie Mortdecai (Johnny Depp, Dark Shadows, Transcendence) is a caricature of an English aristocrat of almost Monty Pythonesque proportions, who does not come across as being all that smart. Well bred and well spoken, but rather dim with it. He is also an art dealer with a rather dubious reputation, and even more dubious competency. Mortdecai is accompanied by his gruffly, if politely (to Charlie and his wife at least) spoken and long-suffering manservant Jock (Paul Bettany, Avengers: Age of Ultron, Captain America: Civil War) who is rather more competent, especially at violence (and pretty much everything else), seems quite a bit smarter and is also rather a bit of a womaniser. Which is something his master really isn't. The pair do resemble Jeeves and Wooster to a degree, with the servant again being noticeably more accomplished than the master, if in this case not as well spoken. Credit: http://en.wikipedia.org/wiki/Mortdecai_%28film%29#mediaviewer/File:Mortdecai_poster.jpgMortdecai is on the verge of bankruptcy and is millions in debt to the UK government in unpaid taxes. His beloved, beautiful, and also long suffering and definitely smarter, wife Johanna (Gwyneth Paltrow, Contagion, Iron Man 3, The Avengers) is selling off some of the family assets to try and keep them afloat. Their marriage is rather strained currently, as Charlie has grown a new moustache of which he is extremely proud, but which his wife is nauseated by. When an art restorer is murdered and the Goya painting she was working on is stolen, MI5 become involved. This is not normally within their purview, but the reputed thief is an international terrorist known as Emil (Jonny Pasvolsky) who wants to use it to fund worldwide revolution. The inspector from MI5, Martland (Ewan McGregor, Haywire, Jack the Giant Slayer), is an old acquaintance of Charlie's from college. Martland is rather infatuated with Mortdecai's wife and, it seems, would enjoy making her closer acquaintance if given the chance. With the theft involving art, Mortdecai being known for having knowledge of the seamier side of the art world and being an old "friend" of Martland, the latter drafts the former in to help. Which he agrees to do, for Queen and country. And travel, reasonable living expenses and 10% of the value of the painting. Mortdecai tries to discover the location of the painting (and Johanna is doing the same in the background, albeit rather more competently), getting entangled with Russian gangsters along the way and having to make a trip to some dreadful place in the western colonies called Los Angeles. This film will definitely not be to everyone's taste. The comedy is primarily slapstick and pretty much every character is actually a caricature. there are really quite a lot of faults with the film, such as a rather poor and definitely fake looking special effects explosion and the noticeably fake gap between Mortdecai's incisors (the light sometimes reflects of this "gap"). You can't really complain about the acting, as everyone is acting like a caricature - which is really what they are. After all, why is Jock staying with Mortdecai when the latter has accidentally shot him a couple of times, except as the stereotypical loyal manservant. Mortdecai is a film that you will probably either enjoy or you won't, without anything in-between. It can be hard to do bad comedy well. Peter Sellars nailed it in Pink Panther. Others, not so much. Truthfully, Peter Sellers probably did a better job. I still enjoyed this though. Oh and I forgot that I dislike slapstick comedy, but may have to give this one a try! Thanks! Be warned, you may not like it. Like I said, I think it's a love/hate film. I like Johnny Depp and could see him in this type of role. To me, this seemed a rather different sort of role for him.